Librarian Susan O'Connell has visited County Kerry, Ireland many times, and will share the best of the places and stories she has discovered on her travels, as well as context for the historical and natural sights you will experience. Enjoy cultural highlights and hidden gems in the Kingdom of Kerry, all while supporting the library. 8 days, 7 nights in County Kerry, on Ireland’s rugged Atlantic coast. Accommodation in an 18th century stone cottage near a sandy Blue Flag beach and National Park. Tour guide and driver to navigate the winding roads, from airport pickup to drop off. Carefully chosen day trips, activities, and attraction admittance. Breakfast, and some lunch and dinners included. Flexible and responsive itinerary can be adapted according to weather and group interests. 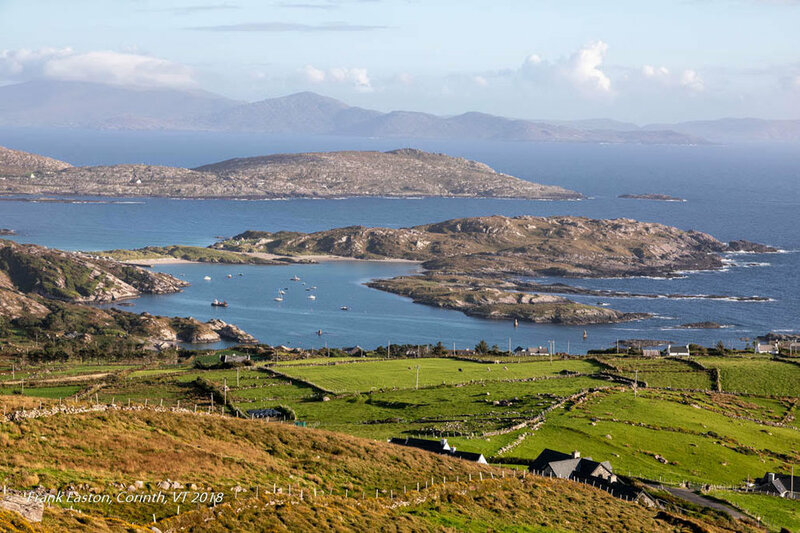 This small group tour to the Kingdom of Kerry will be based in Derrynane, at the tip of the Iveragh peninsula, also known as the Ring of Kerry. We will stay in John’s House, an 18th century stone cottage with an old-fashioned feel and modern amenities, and Rock Cottage, a newer cottage just down the road right next to the Derrynane National Park. Read the description of the 2018 tour by June Pichel Cook here. View the annotated bibliography for the Iveragh Peninsula here. Arrival day- Pick up will be at Shannon Airport (other locations possible with prior consultation), and we will drive to our home base on the Iveragh Peninsula. This will be a quiet day to settle in, nap after the overnight flight, or explore our surroundings. Derrynane beach is nearby with a kilometer of sandy beach to stroll, and a ring fort is up the hill. There are walking trails and a botanical garden to take in. Each day we will explore the region, taking in historical sights and places of natural beauty. Weather will factor in to our daily itinerary, but there following are a sample of the places we will plan to visit. vincent hyland points to a portoguese man o’ war on derrynane beach. At the start of our week we will discover the diverse ecology and historical significance of Derrynane. We will take a tour of Derrynane House, home to Daniel O’Connell, the Liberator of Ireland. After lunch at the Ahamore Tea Room at Derrynane, we will enjoy a tour of the natural park with local naturalist and augmented reality videographer Vincent Hyland. While there, we will have a chance to explore the botanical garden, woodland path, and sea shore. Weather permitting, we will explore the coast from the water with local skipper Des O'Shea. He may take us along the Beara coast and out to Bull Rock, an amazing geologic landform with a tunnel right through the rock. In rougher weather we will stick closer to shore, exploring Derrynane and Kenmare Bay from the sea. Seals, dolphins, basking sharks, and whales are often seen in these waters as well as many marine birds. Diane with a harris hawk on the Falcon walk. We will travel to the Killarney National Park which includes the 19th century mansion Muckross House, Muckross Traditional Farms, the remains of a 16th century monastary, and walking trails. Lunch will be at the Garden Cafe at Muckross. We will also meet up with a falconer and learn to fly a hawk with Killarney Falconry. This will be a full day, and activities will be dictated by the weather. On a fine day we may spend more time walking the trails and enjoying the lakes and garden, and if the weather turns rainy we will spend more time on inside activities. The southern loop of the Ring of Kerry will give us opportunities to explore Kenmare town, a stone circle, and ancient stone bridge, the Staigue stone fort, and perhaps a holy well/fairy well accessed via a path through the woods. We will then travel over the Caha Mountains to Glengariff, where we will take a short ferry ride out to the gardens on Garinish Island. For those disinclined to ferries and gardens, participants can explore Glengariff town on their own. Ned takes in the view from atop staigue stone fort. Traveling north, we will visit archeological sites in Cahersiveen. We will begin at the ruins of Ballycarbery Castle on the river Fertha, then travel on to two nearby Ring Forts. After lunch in Cahersiveen, we may explore more historic sites in town such as the Old Barracks. If the weather if fine, we may choose to wander back along the Skellig Ring, taking in the Kerry Cliffs and St. Finian’s Bay. Our final day is purposefully unscheduled to allow us another chance at any activities that we cancelled due to weather. Alternatively, we may explore the National Park in greater depth, hike the Kerry Way or the Mass Path, or visit a nearby town. Our week over, we will pack up and deliver participants to Shannon airport. Depending on the departure schedules, we may have time to stop along the way. June enjoys the mussels at o’carroll’s cove. Meals will be a combination of on our own, catered, and eaten out. The houses will be stocked with breakfast foods as well as snacks, and morning breakfasts will be prepared by each person according to their taste. We will have some meals prepared for us by local chef Mo Stafford, and we will enjoy the local pubs and restaurants. We will be sure to visit the Blind Piper, O’Carroll’s Cove, Ahamore Tea Room,and Derrynane Hotel. 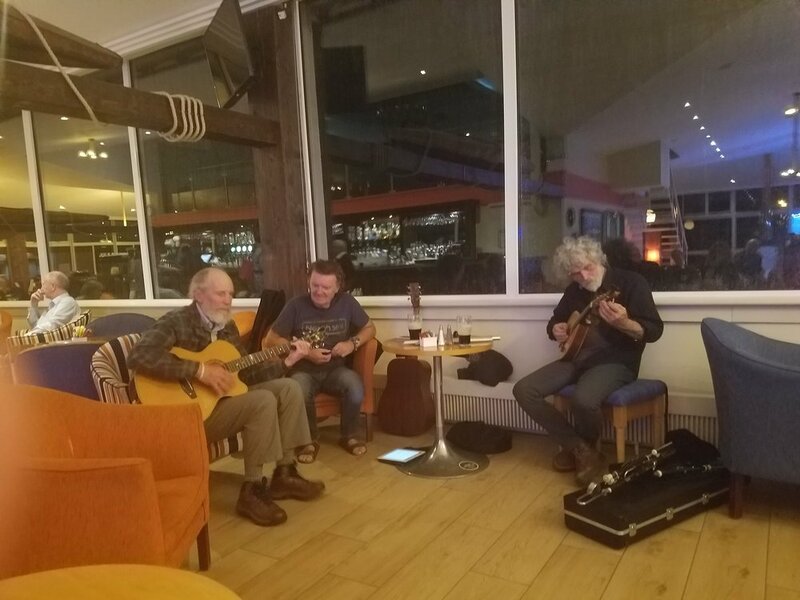 Further afield, we may find ourselves at the Garden Restaurant in Killarney, Fertha Pub in Cahersiveen, An Corcan in Waterville, Davitt’s in Kenmare. CONTACT SUSAN AT THE LIBRARY TO RESERVE YOUR SPOT.